Rory Gevis expresses her artistic talents in several mediums and industries but it all revolves around her creativity and daring to think and produce outside the box. 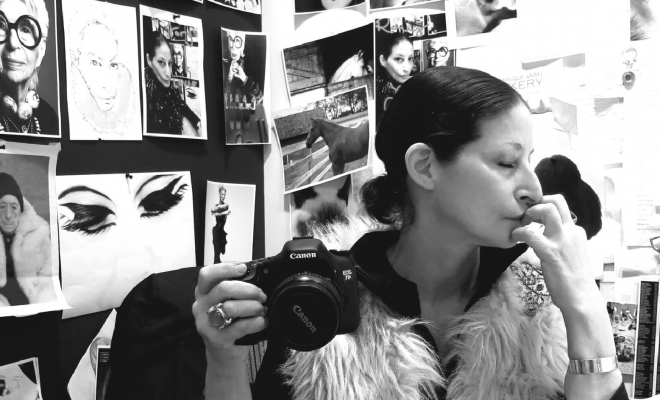 As a fixture in the creative and beauty industry for years Rory first worked as a make-up artist in the U.S. and London and then moved on to Estee Lauder and other cosmetic companies. Her understanding of how to marry various styles and elements is reflected in in her painting, photography, and interior design. Rory first moved into London Terrace Gardens in the 90’s where she loved the creative exchange and grittiness of the neighborhood which seemed to hatch a consistent flow of innovative art styles. After a brief hiatus to the Upper West Side where she “cried every day, missing what she knew was her place,” she returned to buy her forever home. In addition to her continued work in the beauty industry Rory has been working on a series of paintings of her London Terrace neighbors. Our rooftop gardener, Mark Davies, is one of a series; she hopes to capture what and who make the London Terrace community and the charms that attracted her to the building.